I first discovered SEOmonitor in March when they reached out to tell me about their Search Bootcamp. Unfortunately, I was unable to make the event, but I started looking at their tool. I am always interested in platforms and tools that can help those in marketing. This tool was officially launched June 2014. At first it was an internal tool used for the agency, SEOmonitor. It has been designed and developed to help solve many of the problems SEO agencies have. What is the USP of SEOmonitor? SEOmonitor.com helps digital agencies and marketers by providing one of the best indicators for measuring SEO performance that lead to accurate analyses, realistic forecasts and clear reports. SEOmonitor has a Google data-based (not provided) solution that brings back the lost keywords and splits the organic traffic into brand and non-brand. SEOmonitor works as an automatic keyword research tool, as it is able to identify thousands of relevant keywords and provide valuable insights such as SEO Difficulty and the Opportunity to rank in top positions. The Visibility Score indicator enables users to understand their overall performance in Google. It accurately calculates how many people actually see the website in Google results, considering the total amount of searches on a complete list of relevant keywords. This powerful metric helps immediately spot changes in SEO performance, correlate them with non-brand organic traffic evolution and identify which keywords or groups had the biggest impact on the overall visibility. 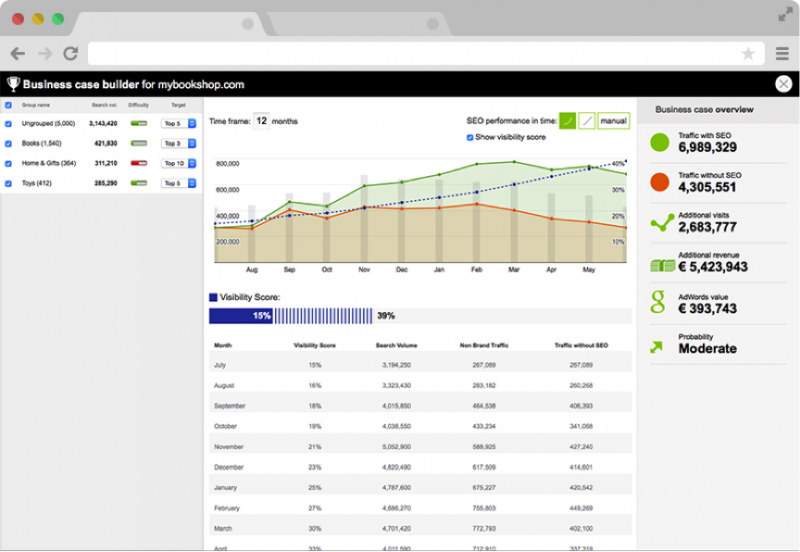 The tool has a Business Case Builder that combines the (not provided) solution with visibility, seasonality and SEO Difficulty data, in order to help agencies and SEO specialists create realistic forecasts of non-brand organic traffic and conversions for an SEO campaign. Having monthly milestones, we are always aware whether the campaign is on track or not. The Opportunity indicator prioritizes the keywords that are likely to have the biggest impact on visits, for less effort, in the shortest period of time. In order to calculate this metric, SEOmonitor takes the search volume, the difficulty and the rank of each tracked keyword into consideration. 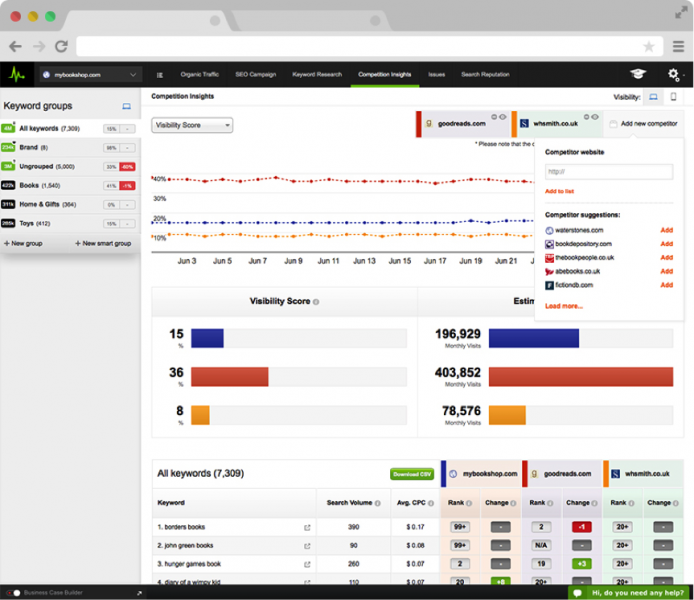 The Dashboard offers a summary view of all the monitored websites and is designed to draw the user’s attention to significant SEO performance changes or site errors. One thing you need to have is your own Analytics or Adobe Analytics as it will not allow you to set up a project without this. But once you have this, it is pretty easy to set up your project. Once complete, you have access to the Dashboard. 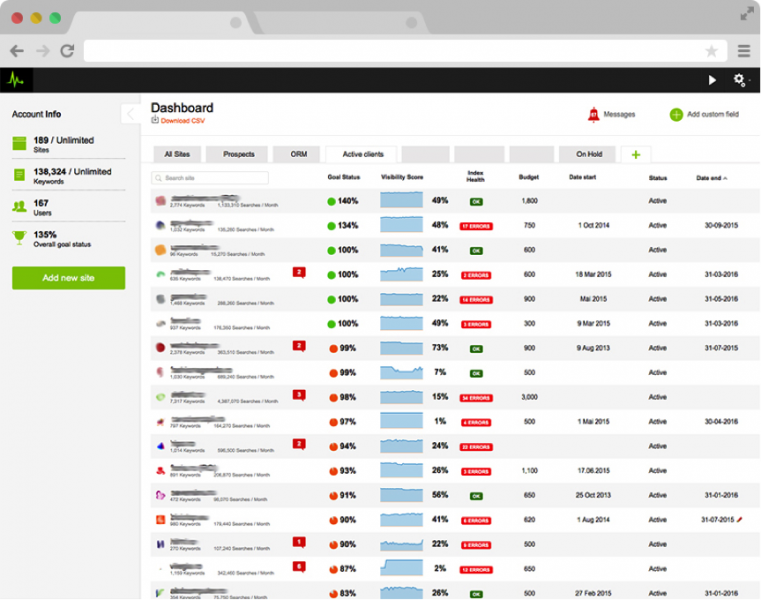 SEOmonitor allows you to see your organic traffic at the click of one button. I compared the data and it was pretty much spot on. This organic traffic is split into branded and non-branded traffic which really helps customers see how well their site is performing for generic terms. What I like about the opportunity indicator, is that it prioritizes the keywords that will have the biggest impact on visits, for the least amount of effort and in the shortest time period. As you can see below, there is the Op. column. It has a pie chart which shows out of 10 the opportunity possibility. It also helps you estimate the revenue you’ll generate by reaching a higher top (3/5/10) and it estimates the AdWords cost. The Op. data is used in the Business Case Builder where agencies forecast their clients’ non-brand organic traffic evolution. This feature helps easily build SEO proposals that focus on results: how many non-brand organic visits the client will have on a monthly basis and how many conversions will this new traffic generate. What’s best is that this estimation also takes into consideration the seasonality of the industry and the current rankings and traffic values. The number of keywords you can upload depends on the price plan you have. Keyword research is not only important to track your own keywords, but also useful when looking at competition insights dashboard, which shows how the competitors feature against these keywords. What are the plans for SEOmonitor this year? “We’ve recently integrated SEMrush and Majestic data and we’ve also added mobile rankings and visibility. We are continuously fine tuning and improving our product, so that it better serves our mission to create the best approach in understanding and communicating SEO. We saw you organised Search Bootcamp in London in March and June this year. Are there sessions on these days where you are showing people how to use SEOmonitor? “The workshops at Search Bootcamp are highly educational; as we’ve created the event to help the attending specialists be more efficient at what they do and learn some new tips and tricks from the best speakers in the industry. I have met the team at the EU Search Awards and they set me up with a free trial so I could review the tool. They offer 14 day free trial to everyone and there is also a video tutorial. They will be at BrightonSEO and other events in the UK this year. So come over and say hello to them. This is an excellent tool and the devs are always willing to listen and improve upon its functionality. Helps you to focus on large numbers of keywords much more effectively and also understand how your client is competing in the SERPS.